As public awareness of food allergies increases, identification and management into adulthood can be difficult to sort out, carrying the risk of misdiagnosis, according to specialists who are trying to improve physician education. Pain is one of the most common symptoms seen by primary care physicians, but it can be the most difficult to handle. Chronic pain often requires time-intensive, complex regimens that call for careful management and monitoring, which is not easy to achieve in a busy primary care practice. Opioids can be used safely for pain management in most patients, but for a small but significant percentage, there is a real chance of addiction and other harms. Experts increasingly look to the prescribed drugs in a medicine cabinet as a source of concern. Geriatrician Doron Garfinkel, MD, developed the Good Palliative-Geriatric Practice algorithm for discontinuing elderly patients' unneeded medications. In a study, he showed how it led to discontinuing 58% of the drugs taken by a group of community-dwelling elderly. A 58-year-old man with type 1 diabetes at age 38, a case of latent autoimmune diabetes of adulthood, reports worsening control of his blood sugars despite increasing doses of insulin. An internist must sort through the facts of the case to find out what's responsible. 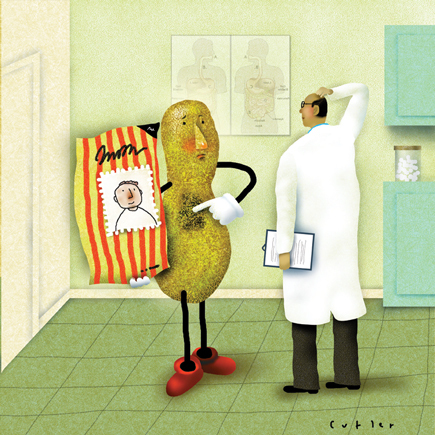 Food allergies can represent a complicated area of diagnosis and treatment for internists. A reader responds about physical exams for PAD. Internists must use their admirable heritage to provide the best care for patients and reclaim internal medicine's central role in delivering health care. This month's column covers three timely yet disparate topics: a new CPT modifier, readiness for Version 5010 electronic claims transactions, and the looming expansion of the recovery audit contractors. The College has a Performance Measurement Committee to represent its member physicians in national measurement programs and to ensure that nationally endorsed performance measures are based on high-quality evidence. William C. Waters III, MACP. A 49-year-old woman is evaluated for recurrent burning and itching on her mid-back that have been present for 2 years. Physical examination discloses ill-defined hyperpigmented patches on the mid-back below the medial aspect of the scapulae, as shown. What is the most likely diagnosis?.